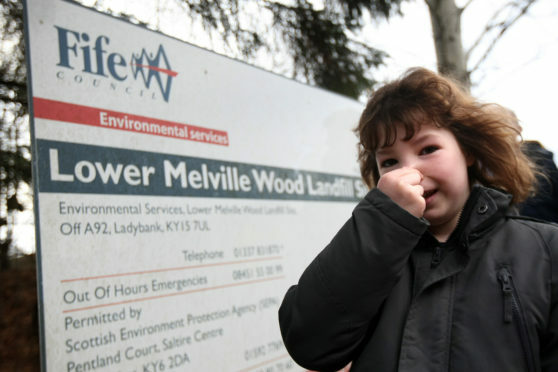 Residents of Letham in Fife are suffering from the 'Melville Pong' from the Lower Melville Wood Landfill site. Madam, – The “Melville pong” is the perfect illustration of one of life’s little ironies (Melville pong prompts promise of immediate work to banish odour, Courier, March 5). In July 2006 it was reported that Fife Council had entered into a contract with EnerG to extract gas from two landfill sites in Fife which would be converted into electricity to be sold on to the National Grid. One of the sites was Lower Melville Wood. The council decided to pay the very high costs for the connection to the grid in the hopes of providing cheap “green energy” and at the same time making a significant reduction in the methane emissions from the landfill site, which it is obligated to do. Policy W1 of The Fife Structure Plan 2006-26 states that in order to meet the Scottish Government’s waste policy and The National Waste Strategy that the Best Practicable Environmental Option (BPEO) set out in the Fife Area Waste Plan would be implemented. Ten year’s on in July 2016 and yet another energy project to harness green energy on this site came on stream and it was connected into the National Grid too. The pong worsened and the complaints began to pour in. This time it came in the form of a wind turbine built by Spectrum Energy Systems, managed by Resource Efficient Solutions, incentivised by the Feed-in-tariff and high hopes of generating £100,000 per annum. All this effort and money to deal with the problem of methane gas escaping into the atmosphere. Perhaps much more attention should also have been paid to the local geological conditions and the possibility of unrecorded shallow mine-workings and the dangers of their associated gases. Methane (firedamp) was a well-known fire hazard to coal miners working underground. Stink Damp (Hydrogen Sulphide) has the characteristic odour of rotten eggs and, as it is less dense than air, is more likely to be noticeable to humans in cold conditions. Blackdamp is commonly found where exposed coal is found and is known to be a problem with abandoned mines. Madam, – It has been striking to note Theresa May’s £1.6 billion post-Brexit bribe to support deprived areas around England. Putting aside the fact that this funding does not apply to Scotland or Wales it is intriguing to note that while Ms May can claim there is no “money tree”, it seems millions of pounds can be conjured up to support those areas that are run-down or “left-behind”, just before a final series of Brexit votes. The so-called Stronger Town Funds package is about seven times less than the EU funding going to these areas. This £1.6 billion package is due to be spread over seven years equating to around £22 million every year. According to a European Union projection the UK would receive £11 billion in funding over a seven-year period, amounting to £1.5 billion annually. So this package of funding is a drop in the ocean when compared with potentially lost EU funding and the loss of public funding due to austerity. It also seems rather odd that parts of the country which are considered to be some of the most deprived, such as the South West of England, have been allocated the smallest amounts of money. While £6.03 per person has been given to this area, in the West Midlands this amounts to £36.86 per person. This new funding clearly has absolutely nothing to do with helping the most deprived parts of the country, but is instead aimed at helping Labour-voting areas in a bid to win over opposition MPs. The post-Brexit funding announcement smacks of desperation from a Government reduced to bribing MPs to vote for its damaging Brexit legislation. Madam, – As we appear to be approaching the end of the Brexit negotiation saga I remain deeply concerned about the eventual outcome. The EU continues to dictate the course of negotiation without resistance from our Government. There is much noise from Westminster, without substance. There is the continued resistance from the Remainers who have no mandate from the electorate to pursue their policy of denial. That we should continue to be subservient to Brussels leading to a vassal state in an organisation that is already showing signs of decline should be removed from any agenda. The No Deal option must remain on the table, as without it, we lose all power of negotiation. I cannot subscribe to Fear propaganda, leading us into the “abyss”. There is much good news about our thriving economy with Brexit in the air, that I can’t see how we can fail to go forward into a bright future even were there to be a No Deal. The PM is, I am sure, a sincere person but her approach to the whole Brexit operation has lacked resolve against the wilful EU. Its whole philosophy has always been to subject nation states to subservience to its will. That is the reason why we voted to leave and to leave is the policy upon which members of parliament were elected, as stated in the party manifestoes. Madam, – Gordon Dilworth believes increasing taxation does not stultify an economy (Economists may not agree, Courier, March 4). He should reflect on the impact of the resulting reduction in people’s purchasing power after government confiscation of more of their hard-earned money, especially if the extra revenue was to be spent on imported goods and services. His evident faith in the wisdom of economists is not all justified. Madam, – I note Alister Rankin’s letter about immigrants from outwith the EU (Detached from reality, Courier, March 4). After Brexit it will be the UK policy to only allow immigrants in who will be of benefit to the UK, eg. nurses, doctors engineers and scientists. This is of course, the direct opposite of what Nicola Sturgeon advocates for an independent Scotland, as she wants to have free movement of immigrants. Needless to say this will put even more pressure on our housing– or lack of it – NHS, schools and education, employment and welfare among other services. And she calls this a benefit? Madam, – I am so fed up with the do-gooders in the country that are arguing that Shamima Begum – who left this country to join IS in Syria in 2015 – should be allowed back into the UK. Why should the country be burdened with the expense of deradicalisating her and the costs of the security to watch her for who knows how long?